To make the generalisation about the population from the sample, statistical tests are used. A statistical test is a formal technique that relies on the probability distribution, for reaching the conclusion concerning the reasonableness of the hypothesis. 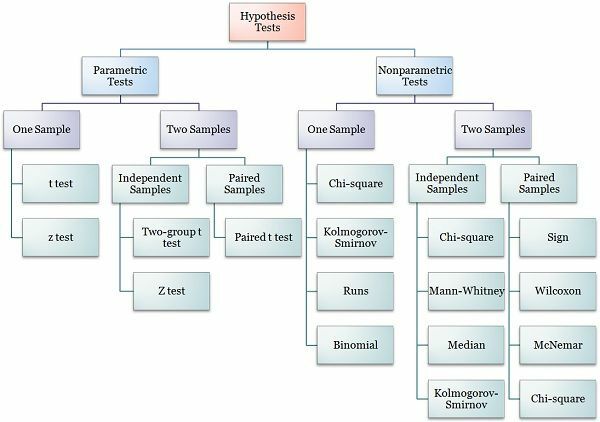 These hypothetical testing related to differences are classified as parametric and nonparametric tests.The parametric test is one which has information about the population parameter. On the other hand, the nonparametric test is one where the researcher has no idea regarding the population parameter. So, take a full read of this article, to know the significant differences between parametric and nonparametric test. Meaning A statistical test, in which specific assumptions are made about the population parameter is known as parametric test. A statistical test used in the case of non-metric independent variables, is called non-parametric test. The parametric test is the hypothesis test which provides generalisations for making statements about the mean of the parent population. A t-test based on Student’s t-statistic, which is often used in this regard. The t-statistic rests on the underlying assumption that there is the normal distribution of variable and the mean in known or assumed to be known. The population variance is calculated for the sample. It is assumed that the variables of interest, in the population are measured on an interval scale. The nonparametric test is defined as the hypothesis test which is not based on underlying assumptions, i.e. it does not require population’s distribution to be denoted by specific parameters. The test is mainly based on differences in medians. Hence, it is alternately known as the distribution-free test. The test assumes that the variables are measured on a nominal or ordinal level. It is used when the independent variables are non-metric. For measuring the degree of association between two quantitative variables, Pearson’s coefficient of correlation is used in the parametric test, while spearman’s rank correlation is used in the nonparametric test. To make a choice between parametric and the nonparametric test is not easy for a researcher conducting statistical analysis. For performing hypothesis, if the information about the population is completely known, by way of parameters, then the test is said to be parametric test whereas, if there is no knowledge about population and it is needed to test the hypothesis on population, then the test conducted is considered as the nonparametric test. Very nice article. students can clearly understand the actual concept. This is excellent. The flowchart was really helpful. Thank you. We are really contented with your views, this means a lot, keep sharing. These informations are very helpful to understand the concepts. Thank you very much for the information and the explanation you’ve given… It helped me to understand the topic much better. It is well detailed and easy to understand. This was extremely helpful on a very technical and difficult subject such as statistics. very much effective documents. This material provides very good clarity on the parametric and non-parametric difference. thank you for the simple yet detailed elaboration. million thanks you saved me. its quite helpful and easy to understand.. Thank you so much for this article, especially the Hypothesis Test Hierarchy chart. I am reviewing statistics, and this chart serves as a roadmap.